When we buy assets for our business we want value for money, so we know that’s what you need for your business, too. Value for money and a personal approach is what you can expect from us. 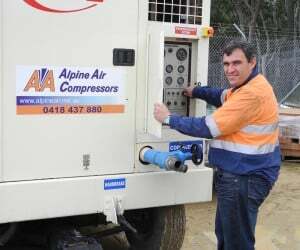 We can assist clients with air compressors for hire, repairs and preventative maintenance and the installation of new compressed air systems. We have experience in a wide variety of industries from mining, heavy industry, mechanical, manufacturing and commercial workshops. So, no matter what industry you’re in, we have the knowledge and experience to anticipate your needs. Our qualified technicians have years of experience to offer our clients and customer service is our priority. We also continue to learn about and apply new techniques and/or products so we can provide our customers with the most suitable and cost-effective solutions for their air systems. So, whether you’re a large project manager, business owner or workshop/factory supervisor and whatever the requirements or scope of work to be done you can be assured you that we have the equipment you want when you want it. For this reason we have been in the industry a long time and still growing. So, give us a thought and consider what we can do to help you.